Page in Progress: Mary MENARY of Gilford Castle was a significant researcher whose work has played a key role in the evolution of this site - even thoughshe died almost half a century before I began my work. Sharon Oddie Brown. August 1, 2005. * On his death certificate, it indicates James Francis died as a result of "carcinoma lung and chest". ** The Certificate of Marriage gives the residence of James Francis as "Ballinode, Macdonell Road". The witnesses were T. JACKSON and R.T. WRIGHT. The acting Chaplain was George A. BUNBURY. 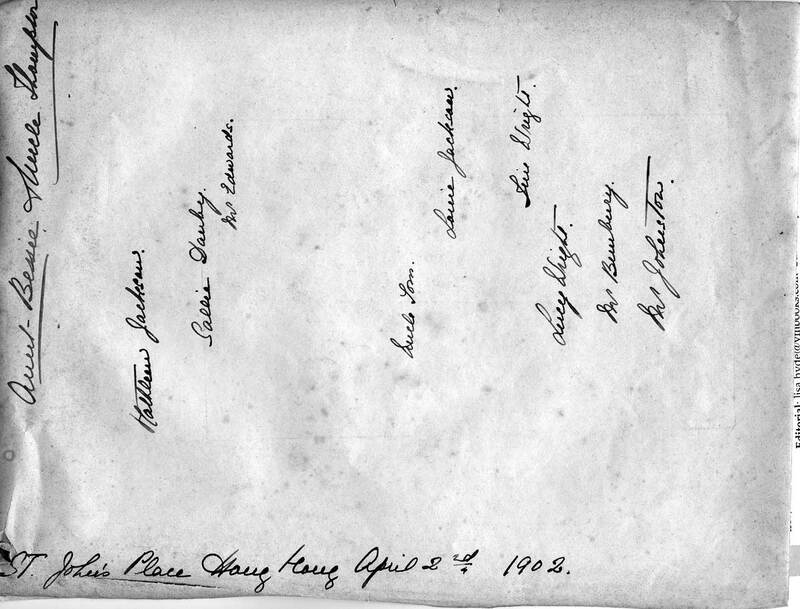 The document was issued 3 August 1902 and signed by the Manilla Consular service. NOTE: Mary MENARY was baptised by Rev. Jackson SMYTHE of Armagh. NOTE: The photos on this page were initially given by Mary MENARY to my great-grandmother, Bessie BROWN (nee JACKSON), who was her aunt. They were given to me by Eilie RYDER of Bangor, Co. Down on my 2005 trip to Ireland. I am eternally grateful. The wedding at St. John's Place, Hong Kong April 2nd, 1902. The bride and groom are James Francis WRIGHT and Mary MENARY. Between them, is Sir Thomas JACKSON (uncle of the bride). On the extreme left is Mr. JOHNSTON, Mr. (REV.) BUNBURY, Lucie WRIGHT née DANBY (wife of Robert Thomas WRIGHT of HSBC in Yokohama), (I am unsure of who the woman is right behind "Jim" WRIGHT - ), Louisa JACKSON (wife of David JACKSON with the boater-style hat), unnamed woman, unnamed man, unnamed woman (seated behind and between Sir Thomas and Mary MENARY), two more unnamed women, and unnamed man, another unnamed woman, Mr. Edwards, Sallie Danby (Sarah DANBY wife of Royden PADFIELD, and a sister of Lucie DANBY ), Kathleen JACKSON (daughter of Sir Thomas JACKSON). BACK ROW: A familiar face - possibly Andrew Coulter Bradford JACKSON - brother of Sir Thomas JACKSON and also uncle of the bride), Robert Thomas WRIGHT of HSBC Yokohama - brother of the groom. James Francis Wright of Ballinode, county Monaghan, Ireland, and managing director, representing Benjamin, Kelly and Potts*, of the Oriete Hotel Co. Ltd., the Manilla Investment Co. and the Phillipines Tobacco Trust, and Miss Menary, daughter of Wm. 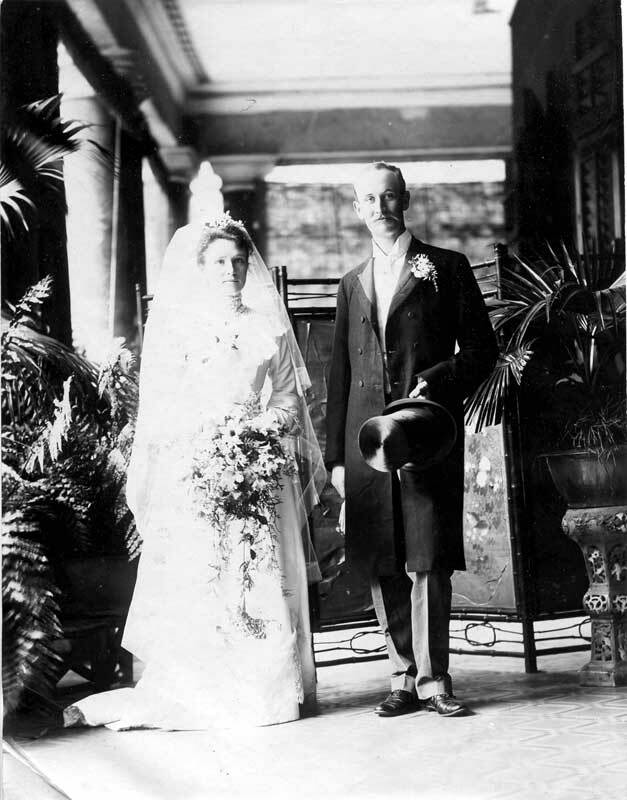 Menary, of Maghery, county Armagh, Ireland, and niece of Sir Thomas Jackson, were married at St. St. John’s Cathedral, Hong Kong on April 2. Reverend J.A. Bombury officiated. Only the immediate friends and relatives were present, and the affair passed off quietly, although the contracting parties were popular in social circles. Mr. & Mrs. Wright arrived at the Zafiro, yesterday, and are registered at the Oriente. Mr. Wright was the recipient of congratulations from his many friends in the city. 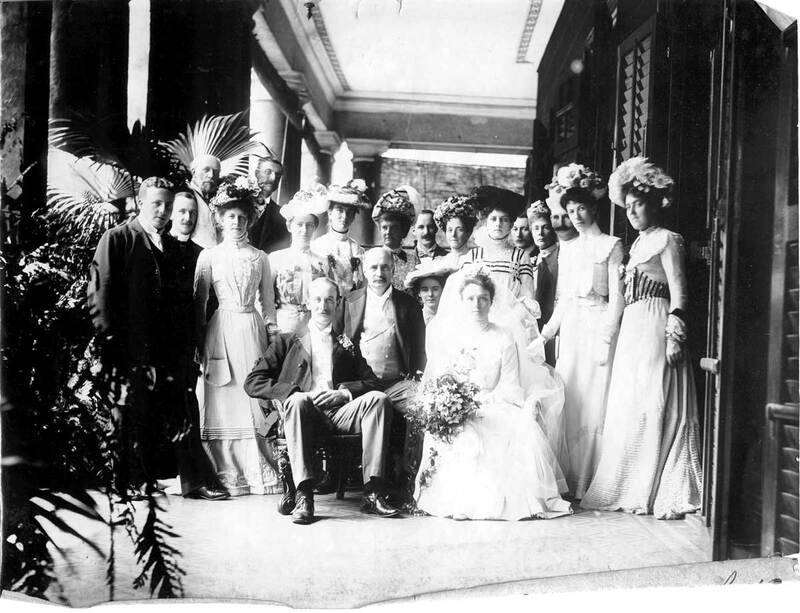 The marriage ceremony took place in the presence of Sir Thomas Jackson, uncle of the bride, Mrs. D. Jackson, sister of the groom Mr. And Mrs. Todd of Smith, Bell & Co. who arrived with the party yesterday, and a couple of intimate friends. Sir Thomas Jackson is the general manager of the Hongkong and Shanghai Banking Corporation. The marriage is a very popular one, as both families are among the oldest in the North of Ireland. Mr. Wright is an attorney-at-law, and one of the foremost business men in the Orient. Though one of the most modest men in Manilla, Mr. Wright has had adventurous experience. He has had service in South Africa, where he was badly wounded, but has now forged his sword into a pruning hook, and means to pursue a domestic, peaceful life under his own vine and a big tree. *A brokerage started in 1880 by Eliezer "Elly" KADOORIE. BIRTH of their child: Almost nine months after their marriage, Mary gave birth to their first and only child, James Francis WRIGHT at the Peak Hospital in Hong Kong. J.F. WRIGHT is described as "of Manilla. The baby was baptised by F.T. JOHNSON on January 7th, 1903. James Francis Sr. is still described as living in Manilla and his profession was described as "Merchant". A.P. ROSE was the assistant Chaplain. PASSPORTS: In their 1924 passports, James Francis is described as a "stock Broker", resident in the UK and being 6'2" with blue eyes and fair hair. Mary was domiciled in Norther Ireland and was 5'6" with grey eyes and white hair. WRIGHT & CO was the name on company letterhead in Hong Kong dated 1939 and accompanying a photo of the wedding of Thomas Jackson HOUSTON and Margaret Emilie BAYNE. One can infer this was one of James' business interests.